When private equity firms and executives ask what drives us at Sager Company, it comes down to one simple premise: We strive to maximize the potential of every opportunity by matching visionary leaders with the right experience to make it happen. We are known for our ability to bring together people with complementary strengths and a singular vision to accomplish a mission. We invest significant time upfront to understand the intricacies of the investment thesis, the goals of the business and stakeholders, and then transform our analysis into action. From the initial on-site engagement to aligning the objectives with processes to placing the right business leader to drive results, Sager has the know-how and experience to maximize your company’s potential. 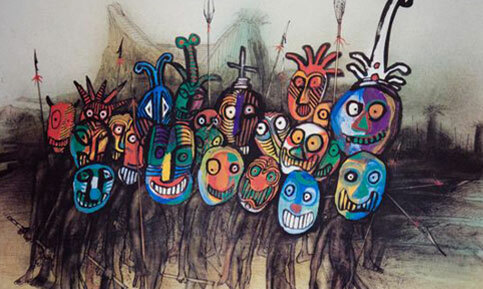 Every day we are inspired by this painting hanging in our office by the innovative artist, Ralph Steadman. It’s the artist’s quirky and unconventional way of seeing the world and his outside the norm thinking that drew the attention and admiration of our founder, Michael Gerbasi. Though the meaning of Mr. Steadman’s illustration is up for debate, as a long time collector and fan of his work, Michael appreciates the humor and irreverence of the piece and notes that the artist has made a long and successful career of approaching things differently. At Sager Company, we strive to be as bold, relentless, passionate, unbridled, energetic, and decidedly different. We know when a timely opportunity arises, critical decisions must be made quickly to overcome obstacles and assist in expediting a successful outcome through sale, recapitalization or public offering. Often, setting the strategy and charting a new course requires a different perspective, whether from innovative thinkers already inside your organization, from a consultant, or from an experienced executive brought in for their specific skills and knowledge to execute on the task at hand.